A long time ago was a great treasure hidden here. Lucky will be he who can find the great fortune. Hákon single-handed bore treasure from this howe. So reads part of one of the runic inscriptions carved on the stones inside Maes Howe, probably in the 12th century AD when Vikings broke into the tomb. They also left pictorial carvings (a dragon, a walrus and a serpent knot), but they took away all the treasure, and we shall never know what it comprised. Maes Howe had already been in existence for over 3.500 years when the Vikings raided it, for it is thought to have been constructed around 2500 BC. It was built on a rocky knoll amidst a landscape not unlike today's, near the Ring of Brodgar and the Stones of Stenness, and is one of the finest monuments of prehistoric Scotland. 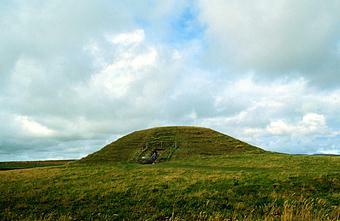 The mound is about 7.3 m (24 ft) high and 35 m (115 ft) in diameter, and a long passage (11 m/36 ft) leads to a tall chamber 4.6 m (15 ft) square, deep in the mound. In one wall is the doorway, but each of the other three walls contains a square hole nearly 1 m (3 ft) above the ground. These open out into small chambers which once may have contained burials. The quality of the drystone masonry is superb: no mortar was used and some of the slabs still fit so well together that a knife blade cannot be inserted between them. It has been estimated that the building of Maes Howe, including the quarrying and transportation, could have taken almost 39.000 man-hours. In local folklore, Maes Howe was believed to have been inhabited by a very strong goblin, the Hogboy, perhaps derived from Haugbuie, Norse for Ghost of the Tomb.